Casting long shadows. 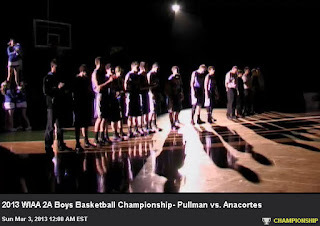 Pullman High School basketball team wins Washington State double A boys championship for first time in Pullman history. I don't normally follow sports, but being a Pullman High School alum perks some interest. Go Greyhounds. Also, it's interesting to note that even small town, local high school sports can now be watched on television. Well, maybe not television, but on the net. wiaanetwork.playonsports.com. One can now watch more than just the big time things that could afford major television in the past. Even games as small as Colfax versus Rosalia can be seen on that web site. I watched a bit of the game which was played at the Yakima Sun Dome. Pullman beat Anacortes and took the state title. Picture is a screen capture I got from the start of the game when the teams were being introduced. 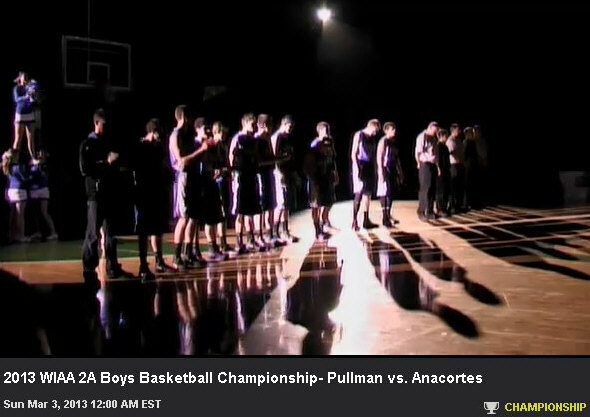 When the lights were dimmed for the starting lineup, Anacortes was in the spotlight, but Pullman was only back lit. Made for an interesting shadow effect, however.